Over lunchtime today, I attended a Quaker meeting for worship. This is unusual in itself – my lunchtime is normally spent in my office with friends and colleagues! 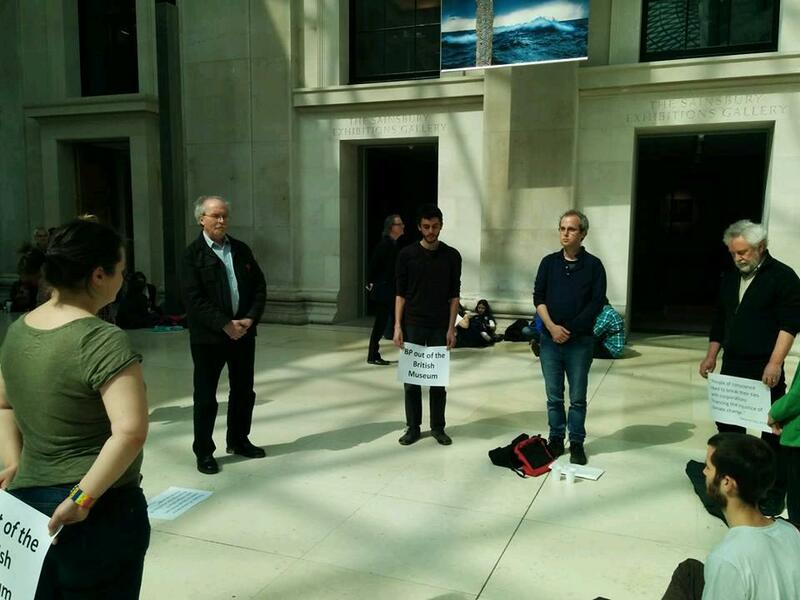 – but it was also unusual because our meeting wasn’t in a Quaker meeting house, but in the atrium of the British Museum – we were holding our meeting as an act of witness in opposition to the sponsorship of the museum by BP. BP are a huge, transnational energy company, profiting from the causes of climate change and large scale environmental destruction (such as the Tar Sands). By holding a short period of silence and handing out some simple flyers, we were able to draw attention to what everyone could already see – the BP logo’s on every sign and billboard in the place! BP play a major role in wrecked ecosystems and climate chaos, posing a serious risk to the lives and well-being of communities all over the world. By paying money to put their name so prominently all over important institutions like museums, they are creating a clever piece of ‘green wash’. By accepting BP’s money, the British Museum are supporting a PR campaign for a company that has a long history of accidents, oil spills and environmental damage they would prefer we forgot about. The leaflets that we distributed to those visiting the museum read “we gather in stillness to show love for our earth, and our resistance to powers such as oil company BP, who sponsor British Museum exhibitions.” While many of us consider our activism as a reflection of our deeper beliefs, it can feel empowering to use traditions and practises we hold dear as actual elements of our protest. The meeting for worship today – at the very scene of the thing we opposed – reminded me of sharing communion with a group of Christians during a blockade of Burghfield Atomic Weapons Establishment a year ago. That act was a powerful symbol, reminding those present that day of the beliefs and traditions that had brought them to that gate, into that road. By incorporating such elements, both actions (and many others like them) had an element of a positive vision of the world, something of the peaceful future we hope and act for, rather than just being an angry “No!” shouted at something we oppose. Of course, it’s not just religious groups who do this; women-only actions or camps empower women to take action together, actors use their specific skills to create theatre with important messages, and knitters knit seven-mile long peace scarves! I think activism is at it’s best when it not only expresses a voice of opposition, but also symbolises something of the people who take action, of their particular vision, of the sort of peaceful world they want to see. Hello everyone in the blogosphere (did I just make that up? ), firstly apologies for the delay in my first blog post coming, I’m not that social media savvy if the truth be told! My name is Andy Pask and over the past 6 months as part of the brilliant peaceworker scheme i’ve been on placement with an organisation called Cord exploring the peacebuilding potential of a solar cooker project that is being run in a refugee camp in Eastern Chad. I was fortunate to be able to visit Chad and the project for a second time in January and thought it would be nice to share some of my initial reflections from the trip. The first thing I noted was that my commute to work was far from normal….. Sometimes I get stuck in a traffic jam on the motorway on my way to my base at Cord’s office in Leamington Spa but commuting in Chad was a whole new ball game! Using the United Nations Humanitarian Air Service (UNHAS) I took three flights from the Chadian capital of N’Djamena before finally arriving on a dirt airstrip in Farchana, Ouaddai Province in Eastern Chad. Flying over endless miles of desert to get my destination combined with the fact that the only air service available is supplied by the UN told me instantly that this area is remote! As I travelled in the car from the airstrip I could see that the rivers were all long dried up (the rainy season ended in October), vegetation was scarce and the earth looked scorched from the daily onslaught by the sun. So why I hear you ask do people live here? The simple answer is many people have no choice and no other place to go. Cord works in this area in four of the refugee camps created as a consequence of the conflict in Darfur back in 2003. The refugees I have met would love to go back to Darfur but conflict continues there, even to this day…..
For me, the climate there served as a daily reminder of how hostile life is living in that region, you only need to spend 5 minutes outside in the sun there to fully appreciate why peacebuilding and access to education and jobs is necessary for the refugees to help themselves shape a different future that means that they are no longer defined as victims of conflict but more able to work independently for a better future. Whilst I was in Chad I had the privilege of supporting the Cord Team with an evaluation of the solar cooker project. We were seeking to understand how solar cookers can impact a number of different areas and in particular conflict in the region. The results from the evaluation were very positive and showed that many things had changed for the better as well as there being lots of potential for the future (i’ll blog a bit more about this in a separate post). Thanks for reading, please get in touch if you have any thoughts/questions, it would be great to hear from you. Bye for now, for those of you going to the QPSW conference at Swanick tomorrow, see you there! 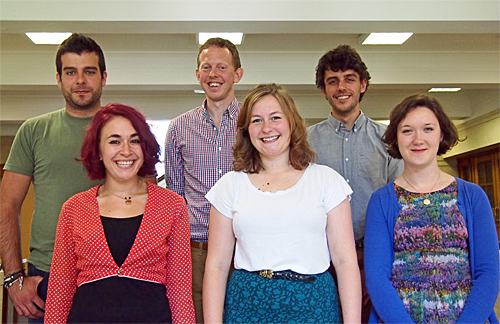 It’s taken the new cohort of Peaceworkers a few months to get sorted with updating the ‘P.O. Box Peace’, but we’ve finally got ourselves organised and looking forward to updating the blog with news and stories. Who knows what has inspired this sudden jump to action – perhaps it was the storm last weekend, or perhaps the knowledge that November is just around the corner and we haven’t got on with it yet! I’m Andrew, and I’m based in London as a UK Peaceworker, working in two different organisations this year -War Resisters International (WRI) for four days a week, and Action AWE (Atomic Weapons Eradication) for one day. WRI is an international network of pacifist organisations dedicated to halting war and the causes of war, and I’m working in the Nonviolence programme, coordinating the revision of a book called the ‘Handbook for Nonviolent Campaigns’, which is used by activists the world over to plan and prepare their campaigns. Action AWE is a grassroots campaign of nonviolent actions dedicated to halting nuclear weapons production at the Atomic Weapons Establishment factories at Aldermaston and Burghfield. With Action AWE I’m focussing on mobilisation and outreach work, arranging and organising talks and nonviolence trainings up and down the country. I’m very aware that if we’re going to scrap nuclear weapons in the next couple of decades, then the next 18 months is when we’ll really make that change happen. My very first day at work – which feels like a long time ago already! – was spent at the Burghfield AWE disarmament camp, because WRI and Action AWE had come together to help organise and mobilise people from across Europe for a big blockade. It was inspiring to see people from as far away as Belgium, Spain, Germany, France and Finland put their bodies in the way of the ongoing development of nuclear weapons in the UK. I had a conversation a few days ago about how ‘peace folk’ can sometimes feel isolated, like they’re working away on their own, and this reminded me of how much of a real privilege it is to be in contact, from the very first day of my placement, with people all over the world and from every walk of life, working for peace. I’ve already been repeatedly inspired and humbled by people’s commitment to creating a more peaceful and just world. This evening I’m planning on spending some time with my house mates, carving some Halloween pumpkins – but with a twist! One will be adorned with the logo for Action AWE, while the other will have WRI’s famous ‘broken rifle’ logo carved into it – however, I reserve the right to post pictures until we’re successful! After a year of writing about our work and adventures in London, Geneva and Bujumbura, the time has come for the Peaceworkers and QUNO Programme Assistants of 2012-2013 to sign off for the last time. Ellie is continuing her work on the Human Impacts of Climate Change Programme at QUNO, Geneva; Owen is working on the Military out of Schools Campaign with ForcesWatch, London; Haifa has been accepted onto the Resident Study Programme at Pendle Hill in Philadelphia; Edith has had her contract extended with Healing and Rebuilding our Communities in Bujumbura; Lisa has gone on to work with UN High Commissioner for Refugees (UNHCR) in Sudan; Alissa is completing her Masters thesis at the School of Oriental and African Studies with beautiful new baby Amani in tow; and Rhiannon is continuing her work with Gender Action for Peace and Security and also Women Living Under Muslim Laws. As you can see, the support of Quakers through this employment really does what it sets out to do; in nurturing, training and supporting committed people to go out into the world and make a change in it. Long may this legacy continue. Having travelled overnight from Glasgow, Owen and Rhiannon report for the final time from the Caledonian sleeper train. We hope you’ve enjoyed our video diaries, we certainly enjoyed putting them together! On the road again, Rhiannon and Owen stop off in Glasgow for a little Haggis. Plural – Haggises? Haggi? Owen and Rhiannon get The Full Scottish Experience. Rhiannon reports from Pluscarden, after the first gig.